Homepage > Hotels in Mahlow > Best Western Premier Airport. 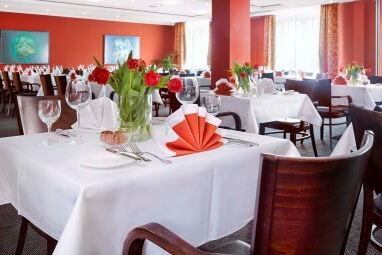 The Best Western Premier Airporthotel Fontane Berlin is located near the airport of Mahlow. The city centre is 19 kilometres, the train station is 2 kilometres away. The distance to the fair complex is 4 km. The 4½-star hotel offers 174 well-appointed guest rooms with air conditioning, minibar, Pay TV, ISDN line, Wi-Fi, room safe, non-smoking rooms, Windows for opening and Allergy-free room. 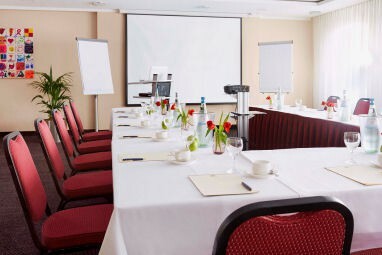 For conferences and meetings, we have 13 meeting rooms that can accommodate up to 500 persons with state-of-the-art equipment like simultaneous interpretation, video camera, big screen, dimming, ISDN, Video projector and video conference. The 4½-star hotel offers 174 comfortable guest rooms with air conditioning, minibar, Pay TV, ISDN line, Wi-Fi, room safe, non-smoking rooms, Windows for opening and Allergy-free room. 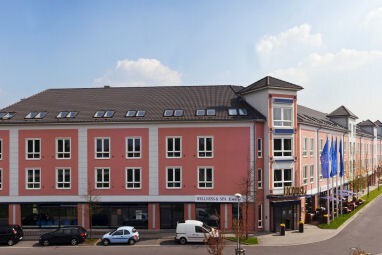 The 4½-star hotel offers 57 comfortable apartments with fridge, dishwasher, water boiler, cutlery/dishes, Satellite TV, hair-dryer, make-up mirror and fax connection. For meetings, conferences, ceremonies, presentations and seminars, we offer 13 conference rooms with a combined space of 1000 sqm. 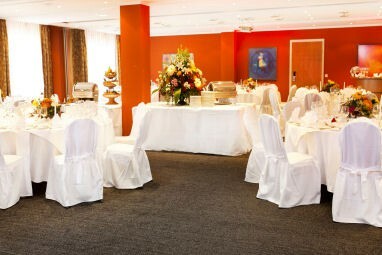 We offer conference space ranging from 40 sqm to 500 sqm. 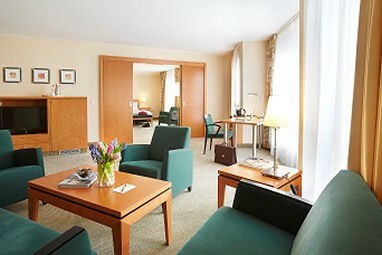 These rooms can be combined to suit your needs. Every conference room is well lit by daylight and could be completely darkened, if needed. 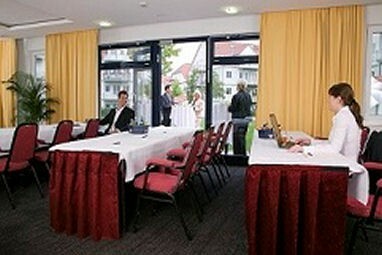 The conference facilities are fully air conditioned and furnished with state-of-the-art conference technology. 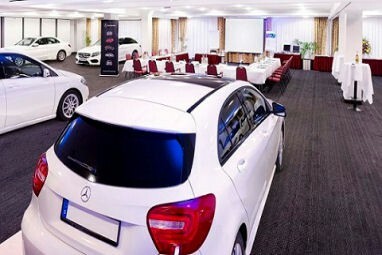 Some conference rooms facilitate an entry for cars. If you are traveling from Hannover, exit to the A 10 direction Berlin / Frankfurt Oder at the Werder highway junction. Exit the highway at Rangsdorf and turn left at the traffic signal which leads to the B 96. Follow the B 96 until you pass Mahlow. Once you have passed Mahlow, turn right at the second traffic signal (ARAL Gas Station, Mc Donald’s) and follow the sign postings. 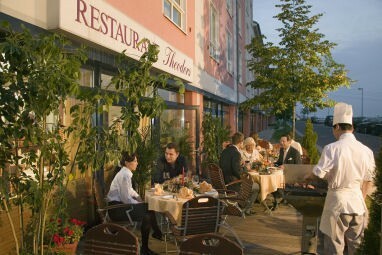 If you are traveling from Nürnberg, exit to the A 10 direction Berlin / Frankfurt Oder at the Potsdam highway junction. Exit the highway at Rangsdorf and turn left at the traffic signal which leads to the B 96. Follow the B 96 until you pass Mahlow. Once you have passed Mahlow, turn right at the second traffic signal (ARAL Gas Station, Mc Donald’s) and follow the sign postings. At Schönefeld junction exit to the A 10 direction Magdeburg / Hannover. Exit the highway at Rangsdorf and turn left at the traffic signal which leads to the B 96. Follow the B 96 until you pass Mahlow. Once you have passed Mahlow, turn right at the second traffic signal (ARAL Gas Station, Mc Donalds) and follow the sign postings. After exiting the airport turn left to the B 96 and follow the main street. After approximately 7 kms turn left to the B 96. At the second traffic signal (ARAL Gas Station, Mc Donald’s) turn left and follows the sign postings. Head southwards direction Charlottenburg on the city highway A 111. Continue on to the A 100 direction Schöneberg. Exit the highway at “Tempelhofer Damm” (Airport Berlin Tempelhof) to the B 96. Continue on the B 96 and after passing Berlin, turn left at the third traffic signal (ARAL Gas Station, Mc Donald’s) and follow the sign postings. From the train station Bahnhof Zoologischer Garten takes the S-Bahn (following the “S” sign) to Friedrichstrasse (S75, S9, S7, and S3). 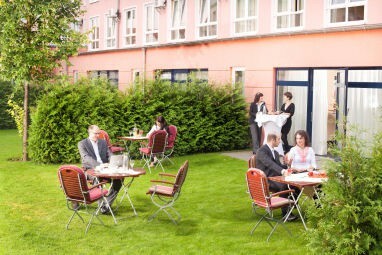 Get off at the train station Friedrichstrasse and take the S2 direction Blankenfelde and exit the train at Mahlow. Our shuttle service could pick you up from Mahlow station. Please book this service in advance. Follow the signs which read Potsdam Babelsberg or highway Magdeburg / Leipzig. At the connection Potsdam Babelsberg turn right to the highway A 115 direction Magdeburg / Leipzig. At the Drewitz highway junction head straight to the A 10 direction Frankfurt / Oder, Dresden, Cottbus until you reach Rangsdorf, where you exit the highway. Turn left at the traffic signal to the B 96, direction Berlin Tempelhof. After passing Dahlewitz and Mahlow turn right at the second traffic signal and follow the sign postings to the hotel. From Berlin with the S-Bahn line S2 direction Blankenfelde, exit at Mahlow station. With the regional train from the Deutsche Bahn direction Wünsdorf, Waldstadt, Elsterwerda or Hoyerswerda, to Blankenfelde. From there take the S-Bahn line S2 direction Bernau until the next stop Mahlow. During the week you could take the bus line 602 direction airport Berlin Schönefeld from the train station in Mahlow, exit at bus stop Mahlow Trafo Haus. From Schönefeld you could also take the bus line 602 during the week, direction Potsdam, Exit at bus stop Mahlow Trafo Haus.